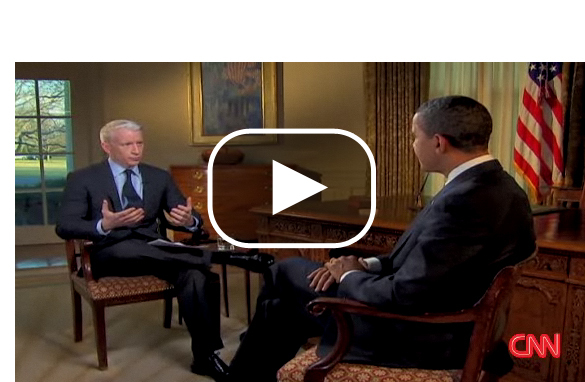 Editor’s Note: Here’s Anderson’s one-on-one interview with President Obama. The Q & A session in the Oval Office covered everything from his “mistake” in nominating Sen. Tom Dashcle to head the Department of Health and Human Services to his plan to fix economy and even how he’s rebranding of the “War on Terror.” Anderson also got a chance to throw in a “lightning round” of questions to find out when the Obamas will get their new dog and to see if Mr. Obama has stopped smoking. Tonight, don't miss Anderson's interview with Pres. Barack Obama. The one-on-one Q & A session covering the economy and more took place in the Oval Office. All of us here in the AC360° newsroom especially liked the lightning round. 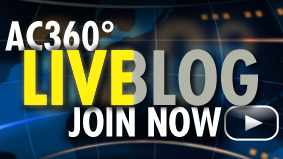 Read Anderson's blog on his White House visit HERE. The President had a tough day. Two of his appointees withdrew their nominations over tax troubles. Former Sen. Tom Daschle dropped his bid to head the Department of Health and Human Services and hours earlier Nancy Killefer cancelled her appointment as Pres. Obama's chief performance officer. Do you think these are bad setbacks for the Obama administration? It took some second-grades to brighten Pres. Obama's day. He and the First Lady visited a Charter school in Washington today. As Erica Hill will report tonight, the message from the President is clear: I care about education. We'll have the raw politics. Join us for all this and more tonight at 10pm ET. 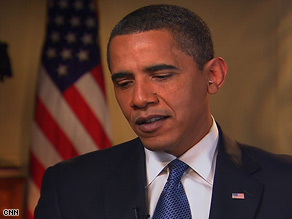 President Barack Obama is interviewed by Anderson Cooper on Tuesday. 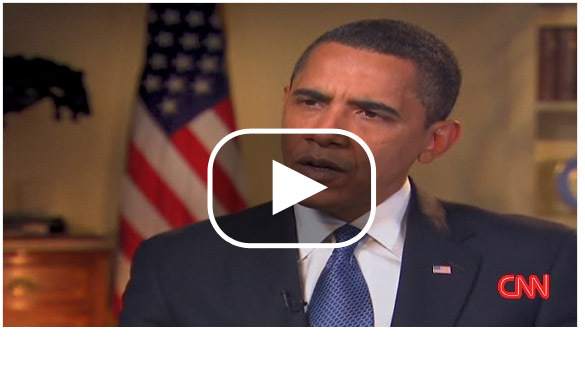 Editor's Note: See Anderson's full interview with President Obama tonight on AC360° at 10PM ET. The Oval Office is smaller than I thought it would be. Maybe it’s just because it was filled with lights and some of the furniture was moved around for the cameras, but it was more intimate than I had imagined. I’d heard President Obama likes to keep the Oval Office warm, but I was still surprised to feel the heat emanating from the open door. Katie Couric was just finishing her interview when I got there, “Wow, it really is hot in there,” I mentioned to David Axelrod who was standing nearby. “They’ve actually cooled it down a bit,” he said. I’d met then-candidate Obama a couple times over the course of the campaign. I moderated the YouTube debate that he took part in, and I spent a day with him on the campaign trail, but this was my first time talking with him as President. I never interviewed President Bush. I’m not sure if it was my coverage of Hurricane Katrina or what, but the Bush White House never seemed to respond to our requests for interviews. Go figure. Today, like all the other network anchors, we were told we only had ten minutes to interview President Obama, so I stayed up late last night and spent most of today whittling down a long list of questions. I also consulted with a number of our great political correspondents to see if they had questions they would want asked. I went into the interview with eighteen questions written down, but the truth is once the conversation started I found myself asking things I hadn’t planned on, and ignoring other questions I was sure I was going to ask. I think the best interviews are genuine conversations, and with the President I tried to just listen, and then respond based on things he brought up. Sometimes I watch interviews on tv and I feel like the questioner has a list of topics to cover and is simply checking them off as they go along. In addition to asking him about Tom Daschle, and the economic stimulus plan, I also wanted to hear him talk about some subjects he hasn’t discussed lately. I asked him what if anything keeps him up at night, and was surprised by his candid response, a response he actually came back to later in the interview to talk more about. It’s rare for a President to ever say he made a mistake. President Obama not only said that today, he said, “I screwed up” when talking about the Daschle nomination. That surprised me. Though it was clearly a tough day for him politically, the President, in person, is remarkably poised. “Cool” is the term often used, and it does apply. The other words I found myself thinking about to describe him were, “calm,” “sharp,” “on point.” He was dressed neatly, and his nails trimmed. I still occasionally bite my nails, and long-term nail-biters like me tend to notice when someone else doesn’t. When you interview the President someone stands in your line of sight and gives you hand cues counting down the minutes. It can be distracting. At times as you are listening to the President respond, you want to ask him to hurry it up so you can get in a few more questions, but thankfully I resisted the impulse. At the end I wanted to make sure to save a few minutes to ask him some lighter more personal questions. I called it a lightning round, and he was nice to play along. I asked him about the dog search, what he likes most about his new high tech car, and whether or not he’s had a cigarette since becoming President. I think you will be interested to hear his answer to those and many other questions tonite on 360 at 10pm. 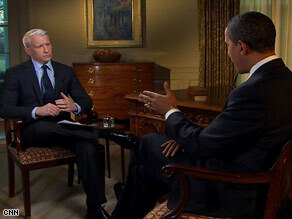 Program Note: Tune in tonight for Anderson's full interview with President Obama on AC360° at 10pm ET. President Obama says he takes the blame for the circumstances that led to Tom Daschle withdrawing. Daschle is Done. Health Reform Is (Probably) Not. Can health care reform go ahead, this year, even without Tom Daschle? Yes. Does this episode–and Daschle's absence–make the task of enacting health care reform harder? Yes, although how much harder is difficult to say right now. 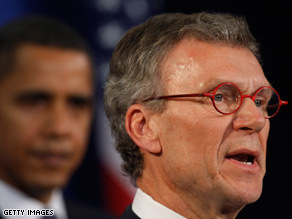 Daschle had a combination of talents not easy to find in one person–poiltical savvy, connections in Washington, and a thorough knowledge of health care policy. But that doesn't mean you can't replace those skills, particularly if you're willing to find several people instead of one. Remember that Daschle was actually up for two posts. He was going to run the White House office of health care reform. And he was going to lead the Department of Health and Human Services. Program Note: Tune in to hear more from Ed Rollins tonight on AC360 at 10pm ET. Sports fans argue that the National Football League is the toughest game outside of war. I would argue Washington politics is also a pretty rough arena. You may not get your nose broken or your shoulder dislocated, but you can sure get your reputation bloodied, and the bruises don't go away by the next game. The latest casualties of D.C. politics are former Senate Majority Leader and, until his withdrawal, Secretary of Health and Human Services designee Tom Daschle; and Nancy Killefer, who resigned as the president's chief performance officer (without the same notoriety). 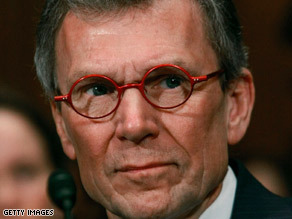 Mr. Daschle is the second nominated member of President Obama's Cabinet, following New Mexico Gov. Bill Richardson, to step down after having his reputation tarnished. He did the honorable thing. He could have survived. The president would have stood by him, and his former Democratic "club members" in the Senate would have confirmed him. Only minutes into his reign at the Justice Department the new Attorney General displayed the casual, affable style for which he was known—and widely appreciated—by career employees from legal scholars to rookie secretaries during his stint as Deputy Attorney General during President Clinton’s second term. So, the huge ovation he received upon his arrival was not surprising. 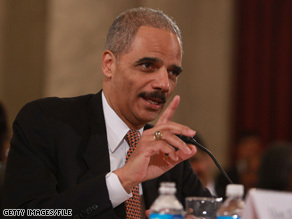 Holder was a popular choice within the Justice Department community when he was nominated, including the important backing of both former FBI Director Louis Freeh and current FBI Director Robert Mueller. Holder took lots of time to shake every hand, take every picture, greet every employee who attended the swearing in. Then without hesitation he waded into the bevy of Justice-based journalists and comfortably began to chat and joke. He provided no important news, but the accessibility was a remarkable change from eight years during which Attorneys General John Ashcroft, Alberto Gonzales, and Michael Mukasey had largely kept the press at arm’s length. As if to accentuate the difference in style, hours later Holder wandered unannounced into the Justice Department press room and plopped down for more give and take. As we watched the CNN monitors with the news that Tom Daschle had resigned, the Attorney General said he’d been too busy to watch any TV news on his first day and he wasn’t quite up to speed on the day’s events. Holder wasn’t sure whether he liked the formal full-length picture of himself which a reporter had torn from a magazine and posted in the press room. But he was at ease with the journalists—both newcomers to the beat, as well as a couple of us old-timers who had been here during his first go-around. This time he’s the boss, and he won’t have to worry that Janet Reno is on the fifth floor wondering why her deputy was chatting with the press. President Obama's makes his first foreign trip today to Canada. 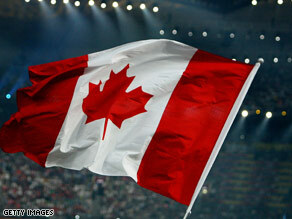 Americans, can you name the capital of Canada or its Prime Minister? Name three major news stories in Canada. Hockey doesn't count. Okay, I'll help you out: automobiles, Afghanistan and energy. Those are important issues in the United States, too, but we'll get back to that in a moment. Canada is a lot like the United States; except when it's not, and Canadians are a lot like Americans, except when they're not. For example, take the results of a poll of approximately 1,000 Canadians and 1,000 Americans taken in November by Angus Reid Strategies. Thirty-three percent of Canadians say Americans would be most willing to rescue them if they were stranded on a remote island; 30 percent of Americans say likewise about Canadians if their situations were reversed (Americans and Canadians both thought the next most likely to come to their aid would be citizens of Great Britain or Australia).